The Hate U Give is a 2018 Crime Drama movie directed by . It stars Amandla Stenberg, Regina Hall, Russell Hornsby, among others. 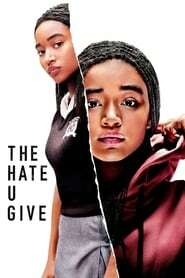 The Hate U Give is currently rated 8.2 stars on the ReelBugs scale. "Two worlds. One voice. No going back." When she said "its the same story just a different name" I felt that. How many more stories are we going to hear before something changes?! Some people are talking about the film being a propaganda. This is HAPPENING almost all day every day. How can you oversee this? This is reality! Just finished watching this movie. I wasn’t trying to see it. Because I knew the content would make me mad. This was put together well. I was mad. I was sad. Even cried a few parts. But I’m glad I watched it. The trailer itself brought tears to my eyes. I really don't understand this hate between white and black skin people. 😂 It doesn't matter, the personality is more important than this. am i the only one that noticed Falcon from avengers?? This movie is talking about a serious message, yet some people are complaining about the actress being light skin. In fairness I've never read the book, but apparently no one is sure what Star looks like. On the cover it's a dark-skinned girl, but some say she was light others say dark. Black is black no matter what shade you are. I'm sure this pointless topic all started when black family comedies replaced a dark-skinned actress with a light-skinned one. I found that annoying myself as well, but this movie shouldn't be judged on whether the girls skin is too light. Being black isn't about the shade of your skin or where you live or how you talk. It's about being who you are. Waoh.. This weekend has been weird 1, i started watching "monsters and men" and then this, all have the same Theme ,racism... We definitely need to change.. Annd for my girl Amandla Stenberg u overkilled ur role.. N u r cute(oh... Did i said that loud, sorry)... N thank u Dominique Fishback for taking up the name "Kenya 🇰🇪"...my country's name... U should all come n visit someday in the future... Overall great movie 🎥 n good job everyone. "When you ready to talk, you talk. Don't ever let no body make you be quiet." Iconic. Name of the soundtrack at 1 : 48 ? Read the novel FIRST! Watch the movie SECOND! Then, form your own conclusion. Don't let the negative critics on here keep you from forming your own decisions about a novel/movie. Hoped a black president would fight more to change things than to be on every tv show loke a pop star, Dr. King did far more and he wasn't even mayor, what a shame! Just finished reading the book can't wait to watch the movie! Now this! What book adaptation isnt she in?